Are you looking to make yourself a bit extra cash? If you are this game is the one for you, by default. Spin your way through 5 reels of money, money, money. Climb your way up the social ladder from poor paper boy all the way to rich, city gent. 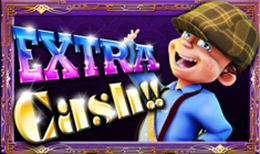 Try and avoid the mansion tax but be sure to pick up some free spins along the way. NextGen Gaming are supplying the global market with an ever-growing selection of online casino games. This largely successful portfolio has led to this developer becoming known for providing one of the best player experiences in the industry. Since this brand’s initial conception in 1999 they have now accumulated hundreds of games ranging from slots, to land based machines and even games available on mobile and tablet devices. NextGen Gaming can be with you wherever you are, making more than just content they produce a form of entertainment and escapism – creating quality every time. This instalment from NextGen Gaming will see gamers playing as the friendly neighbourhood paper boy, with goals of being the best in the world. This 5-reel, 10 payline machine is ready to help this young lad become the best he can be – whilst earning a bit of pocket money at the same time. Simply collect matching symbols within active paylines to start accumulating a cash sum. Players should expect to find a range of symbols around the neighbourhood, including Newspapers, a Trolley, a Newspaper Stand, the paper boy’s trusty companion (his Dog) and a Newspaper Delivery Van. Matching any symbol within an active payline and receive a reward but players should aim to find the Wild and Scatter bonus symbols for an extra helping hand. As well as the paper-themed symbols there are also 5 traditional playing card symbols (10, J, Q, K and A) which can reward players with between 5x and 150x the rounds initial stake. The next valued symbol is the stack of extra Newspapers which can result in 200x the stake. The middle-valued symbols are the Delivery Trollies and the Newspaper Stands – awarding players with 200x and 250x respectively. To win large amounts within the base game, try to match the paper boys Dog, finding 5 in a single payline will result in a massive 300x the initial stake. If payers manage to find 5x delivery trucks to take the paper boy around in he will gift you 400x your initial stake. To make the most out of Extra Cash players should try to use the Wild symbols to the best of their ability. They will not only give a large pay out for matching several symbols in a singular payline (maximum 1000x the initial bet), but they will also take the form of any other none-bonus symbols to help create a winning payline based on the rest of the reel. The extra-wild feature will add even more wilds to the reel during the base game – giving even more chance to win a massive cash prize. As well as the Wilds, Extra Cash also contains a Scatter symbol. The Scatter pays handsomely, matching 3 will multiply your stake by 2, 4 will multiply by 5 and if players manage to match 5 they will be paid a huge 50x their initial stake. When 2, 3 or 4 Scatters appear a Re-Spin round will be triggered. During this round, all reels with Scatters as well as any wild symbols will be held while all other reels’ re-spin, adding a higher chance of winning with every spin. Following this kid on his first career venture, the theme of a paper boy on his rout is truly unique. The graphic work and stackable bonuses are true to the NextGen Gaming brand – aesthetic paired with gaming innovation in the aid of creating something fresh within a well populated industry.